WE ARE CLOSED FRIDAY APRIL 19TH, 2019 FOR GOOD FRIDAY. Purchase a $30 or more water package and you will be eligible to choose an Easter egg from the basket. Open the egg to reveal a hidden number inside. That number will be added to your water package for FREE! 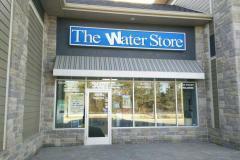 At The Water Store Collingwood, we believe that your well being is most important. You will find more than just water at our store. From our family to yours, we are here to help you live well. We provide U-Fill water to complete home water treatment. Visit our U-Fill Centre for the best in reverse osmosis water. We start with Collingwood city water and put it through a water softener to remove the dissolved limestone from the water. From there it goes through an activated carbon filter to remove chlorine followed by reverse osmosis, a process that removes dissolved solids from the water. After the reverse osmosis process, the water goes into storage tanks where we bubble ozone through it to prevent bacterial growth. The final stage of the filtration process is the water runs through an ultraviolet light to ensure there is no further bacteria present. Each time you refill a bottle, we rinse the bottle with water and ozone to kill any bacteria that may be present. A fresh bottle cap is included in the price of the refill. As a courtesy to our valued customers, we will personally carry each bottle to your vehicle. Collingwood city water contains roughly 115 parts per million of dissolved solids. Our water has between 0 and 1 part per million of dissolved solids. Prices are as low as $2.40 per 18.9 litre bottle. For further information, visit our store and speak with one of our knowledgeable staff members or contact us directly at (705)446-1330. 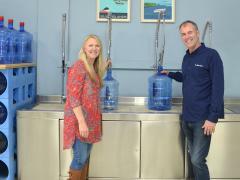 Thank you for choosing The Water Store Collingwood. We look forward to doing business with you! Everyone knows that to protect your investment in your car you need to keep it maintained and in excellent repair. Well the same is true for your water treatment equipment. We can help you determine how best to maintain your current equipment, supply and install routine maintenance items like Ultra-Violet light bulbs and cartridge type filters. No matter who you purchased your equipment from, we would love to help. Also, based on your water chemistry and the age of your equipment, we can determine what steps you can take now to maximize your return from your water treatment investment. With some background information and contact information, we can put you on an annual reminder program for filter and bulb replacement to remind you when these services are necessary. Even if you plan to replace these items yourself we can remind you when they are due for replacement. Regular annual maintenance and filter changes on your water equipment ensure your equipment keeps your water pure and clean. Call Isabel at 705-446-1330 to schedule your appointment now! We've got some healthy tips for you! Learn more about Juice Plus+ by contacting Isabel at issylounds@gmail.com. One of the most misunderstood things about a UV water treatment system is why the lamp should be changed even though it still appears to be working or “on.” UV lamps are engineered to last for 9000 hours, which means they generally need to be replaced annually. Even though the lamp may still illuminate after that time, it is not generating sufficient UVC energy to properly disinfect your water. Have you heard of our referral programs? Existing water customers who have a water package for our U-Fill Station can refer a friend to purchase a water package of their own and both customers will receive 3 FREE refills on their water package. It's as simple as that! Refer a friend to The Water Store Collingwood and when your friend installs new water treatment equipment in their home, you automatically qualify to receive a FREE gift for a dinner for two at The Beaver and Bull Dog, Collingwood. Start calling your friends today!